When you look at 3d modeling software like Blender, you will notice that there are usually two different sphere meshes available to choose from: UVSphere and IcoSphere. The UVSphere looks like a globe. For many purposes it is perfectly fine, but for some use cases, e.g. if you want to deform the sphere, it is disadvantageous that the density of vertices is greater around the poles. Here the icosphere is better, its vertices are distributed evenly. Icospheres are a type of geodesic dome. So I want to create a icosphere programmatically. Its base is an icosahedron (I guess this is where the ico in the name comes from), a regular polyhedron with 20 equilateral triangles. An icosphere is then created by splitting each triangle into 4 smaller triangles. This can be done several times, the recursion level is a parameter to the icosphere. The method getMiddlePoint() does a bit more than just splitting the edge in half. Firstly, it fixes it length so the new point will lie on the unit sphere (i.e. a sphere that sits in the origin and has a radius of 1). 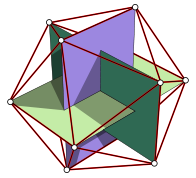 Otherwise we will end up with a refined icosahedron but not with an icosphere. By the way: this is done with the original vertices of the icosahedron too, as the one we created is bigger than the unit sphere. Secondly, it caches the points and reuses them. As each edge belongs to two triangles, without the cache there will be two new middle points created for each edge. I implemented the cache using a dictionary. As the key I put the two vertex indices into an Int64. 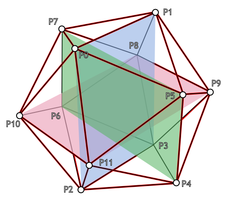 As the middle point of the edge from p1 to p2 is the same as for the edge from p2 to p1, for the key always the smaller index is stored as the first. The following images shows created icospheres where the refinement step has been run once, twice and three times, respectively. The complete C# code looks like following. It creates a MeshGeometry3D data structure to be used with XAML/WPF, but as most mesh structures work very similar it should be easy to rewrite it for other frameworks.